Wow! I won! That's so exciting. This will be my very first vintage pattern ever. I have never even held one in hand :) my e-mail is the nakedseamstress AT gmail DOT com. 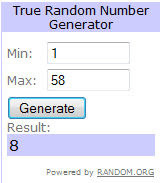 Thanks for hosting this great giveaway!